Phryne Fisher goes to the circus for her sixth mystery. Stripped of her identity and wealth, it's only Phryne's keen wit and sharp thinking that will help her now. Astute, suave and divine, Phryne Fisher moves at flashing pace through this thrilling sixth adventure. Peeling off her wealth and privilege, Phryne takes a job as a trick horse-rider, wearing hand-me-down clothes and a new name. Someone seems determined to see the circus fail and Phryne must find out who that might be and why they want it badly enough to resort to poison, assault and murder. Diving into the dangerous underworld of 1920s Melbourne and the wild, eccentric life under the big top, Phryne proves her courage and ingenuity yet again, aided only by her quick intelligence, an oddly attractive clown, and a stout and helpful bear. Kerry Greenwood is the author of twenty-seven novels and the editor of two collections. 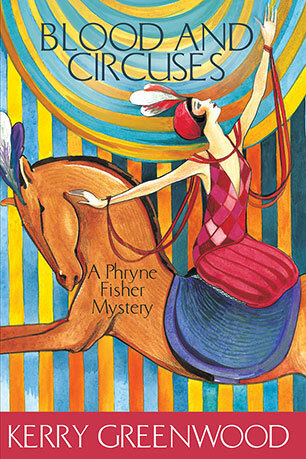 Previous novels in the Phryne Fisher series are Cocaine Blues, Flying too High, Murder on the Ballarat Train, Death at Victoria Dock, The Green Mill Murder, Ruddy Gore, Urn Burial, Raisins and Almonds, Death Before Wicket, Away with the Fairies, Murder in Montparnasse, The Castlemaine Murders and Queen of the Flowers. She is also the author of several books for young adults and the Delphic Women series.